The inhabitants of Trudoxhill in pre-Roman times were probably Belgic Britains who lived in a fortified settlement on Postlebury Hill. When Claudius invaded Britain in 42AD he knew that there were lead mines in the Mendip Hills, and the Romans probably used the road or track at Ridgeway as they spread through the Southwest. After the Romans left Britain, the Saxons gradually spread and defeated the Britains and it is known that the Saxon King, Cenwalh, gave local land to his Chieftains. Witham was given to Wita, Waendal had Wanstrow, Nunna was given Nunney and he in turn gave his kinsman Truttoc, a hilly part of Nunney – Trudoxhill. Trudoxhill is not mentioned in the Doomsday Book of 1089, but Nunney, was held by Calo, the Saxon until the Norman, Tugis gained it during the Norman Conquest. He appeared to have 50 or 60 residents whereas, Marston Bigot was said to be bigger and was owned by Roger Arundel at this time. Nunney in 1260 was held by Henry de Montfort and was known as Nunney Glaston, because it was owned by Glastonbury Abbey. 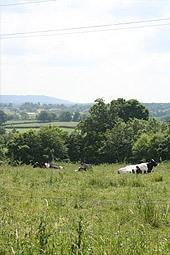 The whole area was part of the Royal Forest of Selwood, which covered land between the Somerset Levels and the Wiltshire Downs. In 1298, Trudoxhill was declared out of the Royal Forest. 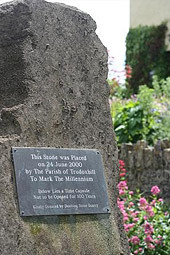 In 1348, the Black Death arrived in Frome. Trudoxhill was affected, along with the rest of the area. In that year, three parish priests died at Cloford, two at Elm, one at Whatley and one at Marston. The villagers of Marston, Nunney and Trudoxhill fled to the Forest and did not return until the outbreak had passed. Edward III granted Sir John Delamare a licence in 1373, to build a castle at Nunney. The Bigots at Marston who had already built theirs without permission were not so lucky, the castle was destroyed and they forfeited their land. After the Bigots lost Marston, the Stourtons held the manor for 200 years, the last one to do so, was executed in 1557, for murdering a man called Hartgill over a land dispute. Marston passed to the crown and then through a series of owners to Richard Boyle, First Earl of Cork, who bought it in 1641. Trudoxhill was involved in the Monmouth Rebellion of 1685. Both armies passed through Frome before Monmouth’s defeat at Sedgemore. The Earls of Cork and Orrey owned Marston House and the estate until 1905, when it was sold to London businessman, Major Robert Bonham-Christie. It has been in the ownership of the Yeoman family until recently. 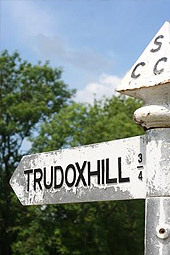 In the 19th Century, Trudoxhill was a thriving community, being self-supporting and bustling with shops and small industry. The Lords of the Manor were the Theobalds with the local priest being the Reverend T J Theobald. 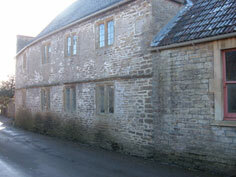 Trudoxhill had the majority of industrial workers, whilst Nunney was the residential area. 150 years ago, agriculture was the main stay of local industry, but by the end of the 20th Century, very few people made their living from farming. The Rev. Richard Jones bought the Congregational Chapel building from a Robert Newport who had built it in 1699. Nobody was buried in the chapel until the end of the 18th Century. Family vaults for the Miles and Ball families are still shown in the chapel. It has also been used as a Schoolhouse. In the middle of the 19th Century, it had 50 pupils. The chapel had a flourishing Sunday school into the 1970’s. The Hoddinott family has been associated with the chapel since 1820. Moving into the 21st Century, the chapel has had the good fortune of being completely renovated – allowing services to take place once again. Copyright © 2015-2019. Trudoxhill Parish Council. All Rights Reserved.